Frank Bello, John Bush, Marty Friedman et al. Throughout history, the San Francisco Bay Area has long been named as the epicentre for Thrash Metal; whereas Los Angeles is invariably considered the Hair-Metal capitol. 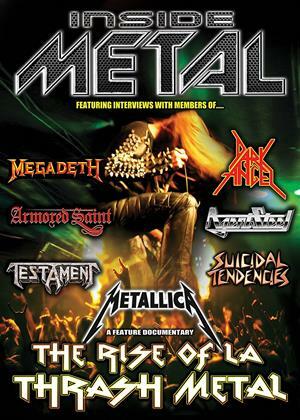 Whether it'd be the legendary icons METALLICA, SLAYER and MEGADETH, or punk/metal renegades SUICIDAL TENDENCIES, or underground thrash legends DARK ANGEL and HIRAX, LA was the birthplace of three out of the "Big 4" thrash bands as well as the breeding grounds for many of the more unconventional speed/thrash/ punk-metal bands. So why is it that LA thrash metal has taken a backseat to the NorCal Bay Area? This is one of many issues that will be revealed in this compelling documentary presented by MetalRock Films. This third instalment of the ground-breaking INSIDE METAL series takes the viewer on a journey into the evolution of Thrash Metal...or "speed metal" as it was originally labelled. Appropriately titled "The Rise of LA Thrash Metal" explores the '80s metal counterculture with first-hand insight from the bands and artists that ruled the LA Metal underground as well as journalists, scenesters, and insiders from a time in history when metal music was becoming more and more creative, experiential, uncompromising and extreme. A time when Thrash Metal was thriving in LA! Featuring exclusive, never-before seen, interviews with Lars Ulrich, Dave Lombardo, Rocky George, Eric Peterson, David Ellefson and many more.